IIEQPro is a 10-band fully parametric track EQ with a choice of 12 filter types per band: analog peak, digital peak, notch, low and high pass with 12 and 24 dB per octave, two band pass filters, an all pass filter, a low shelf and a high shelf. The filters can be wired in series or in parallel, allowing for even more combinations. Bugfix for some issues that sometimes surfaced when renaming multitrack instances, and it contains some minor internal improvements of the GUI drawing. 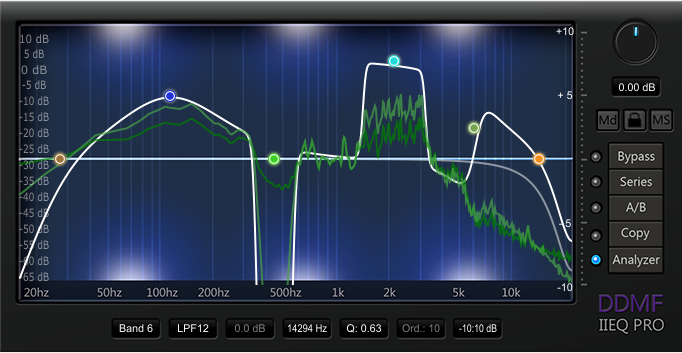 Smoother response of the frequency analyzer. 7 new (Butterworth) filter types (low pass, high pass, band pass, band stop, low shelf, high shelf and band shelf) with slopes adjustable from 6 dB to 60 dB per octave have been added. Some graphical issues when rendering the filter response graph were fixed. A possible crash when dialing in 22 KhZ was fixed.